See my Time-Life Navigation © article lists for examples taken from the daily news. When I decided in 1926 not to go to college but to go to work after finishing secondary school, my father was quite distressed; ours had long been a family of lawyers and doctors. He did not try to change my mind. And he did not prophesy that I would never amount to anything. I was a responsible adult wanting to work as an adult. Some thirty years later, when my son reached age eighteen, I practically forced him to go to college. Like his father, he wanted to be an adult among adults. Like his father, he felt that in twelve years of sitting on a school bench he had learned little, and that his chances of learning more by spending another four years on a school bench were not particularly great. Like his father at that age, he was action-focused, not learning-focused. And yet by 1958, thirty-two years after I had moved from high school graduate to trainee in an export firm, a college degree had become a necessity. It had become the passport to careers. Not to go to college in 1958 was “dropping out” for an American boy who had grown up in a well-to-do family and done well in school. My father did not have the slightest difficulty in finding a trainee job for me in a reputable merchant house. In my father’s generation (he was born in 1876), going to college was for the sons of the wealthy and a very small number of poor but exceptionally brilliant youngsters (such as he had been). Of all the American business successes of the nineteenth century, only one went to college: J. P. Morgan went to Gottingen to study mathematics, but dropped out after one year. Few of the others even attended high school, let alone graduated from it *1. By my time, going to college was already desirable; it gave one social status. But it was by no means necessary nor much help in one’s life and career. When I did the first study of a major business corporation, General Motors *2, the public relations department at the company tried very hard to conceal the fact that a good many of their top executives had gone to college. The proper thing then was to start as a machinist and work one’s way up *3. As late as 1950 or 1960, the quickest route to a middleclass income—in the United States, in Great Britain, in Germany (though no longer in Japan)—was not to go to college; it was to go to work at age sixteen in one of the unionized mass production industries. There one could earn a middle-class income after a few months—the result of the productivity explosion. Today these opportunities are practically gone. Now there is practically no access to a middle-class income without a formal degree which certifies to the acquisition of knowledge that can only be obtained systematically and in a school. The change in the meaning of knowledge that began two hundred fifty years ago has transformed society and economy. Formal knowledge is seen as both the key personal and the key economic resource. In fact, knowledge is the only meaningful resource today. The traditional “factors of production”—land (i.e., natural resources), labor, and capital—have not disappeared, but they have become secondary. They can be obtained and obtained easily, provided there is knowledge. And knowledge in this new sense means knowledge as a utility, knowledge as the means to obtain social and economic results . These developments, whether desirable or not, are responses to an irreversible change: knowledge is now being applied to knowledge. This is the third and perhaps the ultimate step in the transformation of knowledge. Supplying knowledge to find out how existing knowledge can best be applied to produce results is, in effect, what we mean by management. But knowledge is now also being applied systematically and purposefully to define what new knowledge is needed, whether it is feasible, and what has to be done to make knowledge effective. It is being applied, in other words, to systematic innovation *4. Like its two predecessors—knowledge applied to tools, processes, and products, and knowledge applied to human work—the Management Revolution has swept the earth. It took a hundred years, from the middle of the eighteenth century to the middle of the nineteenth century, for the Industrial Revolution to become dominant and worldwide. It took some seventy years, from 1880 to the end of World War II, for the Productivity Revolution to become dominant and world-wide. It has taken less than fifty years—from 1945 to 1990—for the Management Revolution to become dominant and worldwide. 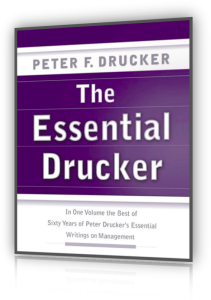 See The Essential Drucker for an introduction to world-class management. Management did indeed first emerge in its present form in large-scale business organizations. When I began to work on management some fifty years ago, I too concentrated on business management *5. But we soon learned that management is needed in all modern organizations. 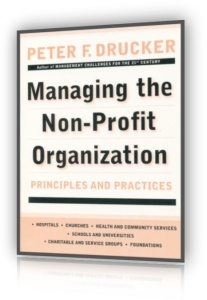 In fact, we soon learned that it is needed even more in organizations that are not businesses, whether not-for-profit but non-governmental organizations (what in this book I propose we call the “social sector”) or government agencies. These organizations need management the most precisely because they lack the discipline of the “bottom line” under which business operates. That management is not confined to business was recognized first in the United States. But it is now becoming accepted in every developed country. We now know that management is a generic function of all organizations, whatever their specific mission. It is the generic organ of the knowledge society. Management has been around for a very long time. I am often asked whom I consider the best or the greatest executive. But management as a specific kind of work was not seen until after World War I—and then by just a handful of people. Management as a discipline only emerged after World War II. As late as 1950, when the World Bank began to lend money for economic development, the word “management” was not even in its vocabulary. In fact, while management was invented thousands of years ago, it was not discovered until after World War II. One reason for its discovery was the experience of World War II itself, and especially the performance of American industry. But perhaps equally important to the general acceptance of management has been the performance of Japan since 1950. Japan was not an “underdeveloped” country after World War II but its industry and economy were almost totally destroyed, and it had practically no domestic technology. The nation’s main resource was its willingness to adopt and adapt the management which the Americans had developed during World War II (and especially training). Within twenty years—from the 1950s, when the American occupation of Japan ended, to the 1970s—Japan became the world’s second economic power, and a leader in technology. When the Korean War ended in the early 1950s, South Korea was left even more devastated than Japan had been seven years earlier. And it had never been anything but a backward country, especially as the Japanese systematically suppressed Korean enterprise and higher education during their thirty-five years of occupation. But by using the colleges and universities of the United States to educate their able young people, and by importing and applying the concepts of management, Korea became a highly developed country within twenty-five years. With this powerful expansion of management came a growing understanding of what management really means. A manager in other words was a “boss,” and management was rank and power. This change means that we now see knowledge as the essential resource. Land, labor, and capital are important chiefly as restraints. Without them, even knowledge cannot produce; with out them, even management cannot perform. But where there is effective management, that is, application of knowledge to knowledge, we can always obtain the other resources. To be sure, these associates are subordinates in that they depend on the boss when it comes to being hired or fired, promoted, appraised, and so on. But in his or her own job the superior can perform only if these so-called subordinates take responsibility for educating him or her, that is, for making the superior understand what market research or physical therapy can do and should be doing, and what results are in their respective areas. In turn, these “subordinates” depend on the superior for direction; they depend on the superior to tell them what the score is. Their relationship, in other words, is far more like that between the conductor of an orchestra and the instrumentalist than it is like the traditional superior — subordinate relationship. The superior in an organization employing knowledge workers cannot, as a rule, do the work of the supposed subordinate any more than the conductor of an orchestra can play the tuba. In turn, the knowledge worker dependent on the superior to give direction and, above all, to define what the score is for the entire organization—that is, what are the standards and values, performance and results. And just as an orchestra can sabotage even the ablest conductor and certainly even the most autocratic one—a knowledge organization can easily sabotage even the ablest, let alone the most autocratic, superior. Altogether, an increasing number of people who are full-time employees have to be managed as if they were volunteers. They are paid, to be sure. But knowledge workers have mobility. They own their means of production, which is their knowledge. What motivates—and especially what motivates knowledge workers—is what motivates volunteers. Volunteers, we know, have to get more satisfaction from their work than paid employees, precisely because they do not get a paycheck. They need, above all, challenge. They need to know the organization’s mission and to believe in it. The need to see results. Implicit in this is that different groups in the work population have to he managed differently, and that the same group in the work population has to be managed differently at different times. Increasingly, employees have to be managed as partners—and it is the definition of a partnership that all partners are equal. It is also the definition of a partnership that partners cannot be ordered. They have to be persuaded. Increasingly, therefore, the management of people is a marketing job. One begins with the question, “What does the other party want? And this is neither “Theory X” nor “Theory Y,” nor any other specific theory of managing people. Maybe we will have to redefine the task altogether. The starting point may be a definition of results—just as the starting points of both the orchestra conductor and the football coach are the score. The productivity of the knowledge worker is likely to become the center of the management of people, just as the work on the productivity of the manual worker became the center of managing people a hundred years ago, that is, since Frederick W. Taylor. One does not “manage” people. … And what is the Educated Person’s role in a knowledge society. There is no “Queen of the Knowledges” in the knowledge society. All knowledges are equally valuable; all knowledges, in the words of the great medieval saint and philosopher St. Bonaventura, lead equally to the truth. But to make them paths to truth, paths to knowledge, has to be the responsibility of the men and women who own these knowledges. Collectively, they hold knowledge in trust. Capitalism had been dominant for over a century when Karl Marx in the first volume of Das Kapital identified it (in 1867), as a distinct social order. 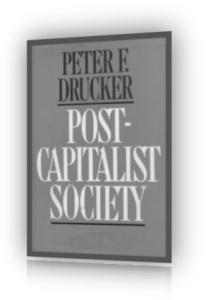 The term “Capitalism” was not coined until thirty years later, well after Marx’s death. It would therefore not only be presumptuous in the extreme to attempt to write The Knowledge today; it would be ludicrously premature. But we can hope that a hundred years hence a book of this kind, if not one entitled The Knowledge, can be written. That would mean that we have successfully weathered the transition upon which we have only just embarked. It would be as foolish to predict the knowledge society as it would have been foolish to predict in 1776—the year of the American Revolution, of Adam Smith’s Wealth of Nations, and of James Watt’s steam engine—the society of which Marx wrote a hundred years later. And it was as foolish of Marx to predict in mid-Victorian Capitalism—and with “Scientific infallibility”—the society in which we live now. The Effective Executive preview and The Effective Executive in Action. 1. In the novels of Edith Wharton, the chronicler of American society around 1910 and 1920, the sons of the old and rich New York families do go to Harvard and to Harvard Law School, but practically none of them then practices law. Higher education was considered a luxury, an ornament, and a pleasant way to spend one’s early adulthood.